The 27-year-old Perakian, who is one half member of the 2016 Rio Olympics silver medallist with Pandelela Rinong, scored 397.50 points in the women's 10m platform individual. 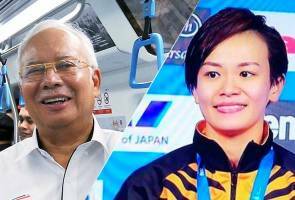 KUALA LUMPUR: Prime Minister Datuk Seri Najib Tun Razak today congratulated national diver Cheong Jun Hoong who created history by becoming the first Malaysian athlete to win the gold medal at the World Aquatics Championships in Budapest, Hungary on Wednesday (Thursday in Malaysia). "Congratulations @cheongjunhoong! First world champion #Negaraku in the Women's Platform event at #FINABudapest2017," said Najib on his Twitter today. Former world champion, Si Yajie of China, grabbed the silver medal with 396.00 points, while her fellow teammate, Ren Qian, who is the 2016 Rio Olympics gold medallist, had to settle for bronze medal after amassing 391.95 points, according to Fina official website, www.fina.org. Meanwhile, Deputy Prime Minister Datuk Seri Dr Ahmad Zahid Hamidi regarded Jun Hoong's victory as a national pride. "Congratulations @cheongjunhoong world champion in women's 10m platform individual. History is created and is a national pride. Thank you national athletes," he said on his Twitter. Alamak! Thanos lenyapkan separuh hasil carian di Google?